Nighthawk Holiday Hustle 5K & Fun Run, 8:00 a.m.
Online registration for this event has closed. Register at St. Martin de Porres Catholic School on Thursday, January 31 and Friday February 1 from 9:00am-6:00pm or Saturday morning on-site beginning at 7:00am. Fun Run/Walk - 8:00 a.m.
5K Run - 8:30 a.m.
For those that wish to sleep-in but still support the St. Martin de Porres' Nighthawks. Join us for a fun-filled morning of Holiday cheer and a morning run. Please show your Christmas and Holiday Spirit with costumes or festive attire. Food trucks will also be available for after-the-run snacks! To add to the festivities, Hustle Gear (Santa Hats and Jingle Bells) can be purchased separately for $5 with your registration. If you would like to purchase Hustle Gear, please check the box on step 2 of the registration form. The 5K and Family Fun Run/Walk will begin and end in the west parking lot of St. Martin de Porres Catholic School. 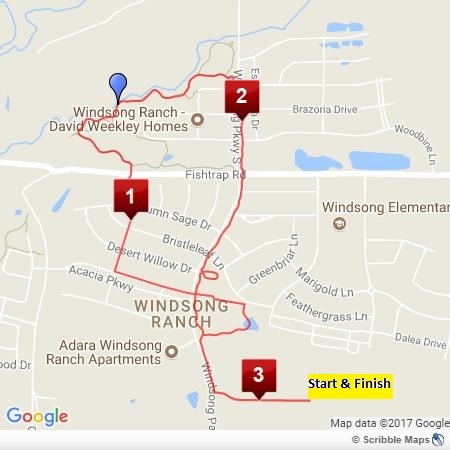 Both courses are on city streets, sidewalks and trails within Windsong Ranch. There will be one water station along the 5K route. The 5K will be a timed by Chip-2-Chip Race Timing and the timing chip will be located on your bib number. You must wear your bib number on your torso on the outside of your clothing to be timed correctly and eligible for awards. Results will be posted at the race and can be found online on the Nighthawk Holiday Hustle website. NEW THIS YEAR: Parking is available in the EAST parking lot. Please use the east driveway off of Teel Parkway. The driveway off of Windsong Parkway will be closed to vehicle traffic. Parking attendants will be directing participants to turn east on Fishtrap Road to turn south on Teel. The Windsong Road driveway will be made available at the conclusion of the event. We ask that all participants exit through the east driveway. This is to ensure our runners' safety. The following dates and times have been set aside for Packet Pickup for anyone registering by Wednesday, January 30, 2019 by 3:00 p.m. All other online registrations will need to be picked up on race day. You will be allowed to pick up your friends' and families' race packets. Bib numbers and timing chips will be available at packet pick-up. 1st, 2nd & 3rd place will be awarded to the following categories in the 5K Run. The Fun Run will not be timed. However, the 5K Will be timed! When this page loaded, the official time was 10:40:48 PM EDT.